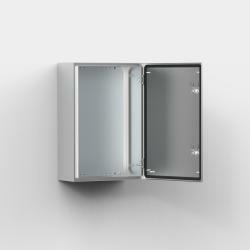 The stainless steel single door wall mounted enclosure range, ASR, with a IP 66 protection degree, is available off the shelf in many different sizes. The risk for component failure, and with that unnecessary downtime, is eliminated as water and dust are prevented from entering the enclosure. This enclosure range is well suited for industries such as food and beverage and pharmaceuticals, as well as almost all other environments, grade dependant. AISI 304 / AISI 316L pre-grained stainless steel. Body: 1.5 mm. Door for AISI 304: 1.5 mm / 2 mm for enclosures with a height or width of 600 mm or greater. Door for AISI 316L: 2 mm. Mounting plate: 2 mm galvanized steel. Corner formed in one piece. Surface mounted, with 130° opening. Concealed AISI 304 stainless steel hinges with captive pin. Can be mounted to allow left or right hand opening. For AISI 316L, sealing is ensured by an injected one piece silicone gasket. Inner M6 welded studs, to mount door profiles MMDP. Eldon customized zamak double-bit 3 mm lock, with 90° movement and anti-vibration mechanism. 1000 mm high enclosures and above have espagnolette three point locking. Stainless steel lock and other versions are available as accessories. No gland plate openings as standard, to maximise sealing and cleanliness. For outdoor environments, exposed to precipitation, the use of a rain hood is advised. Also in environments known for quick temperature changes, consideration to condensation should be taken. Please see the thermal management section.